One week from today is the official release date of Shadeborn, the fourth book in the Nightblade Epic, but you can find a link in the description to get your copy early. So I’ve talked in the past about how the release of the first three books in the Nightblade Epic was when my author career first started to take off. I was suddenly selling enough books to write full-time. And Shadeborn was the first book I wrote and released to an existing audience that was bigger than anything I’d ever had before. But Shadeborn was bigger in more than one way. Not only did it release to a bigger audience, but the story inside the book takes on a whole new scope as well. In the first three books of the series, Loren is still trying to figure herself and her journey out, and that’s partially because I was still trying to figure her and her journey out. Underrealm was this half-formed idea without a clear direction. I was building the world as I was telling the story. But by Shadeborn, I had figured out the world and the big, epic conflict that was brewing in the nine kingdoms. More importantly, I had figured out Loren’s role in it. I had known she would be important, but I’d finally figured out how her story was going to play into the larger story of the world. And because of that—because, by this point, I had literally figured out the END of Loren’s story—I was able to start putting things into the book that would foreshadow things that wouldn’t see print for years. I’m dead serious about that: there are moments in Shadeborn that will have emotional resonance in Underrealm novels that will be written years from now—at least if I do it right and manage not to screw it up. And on a 100% related note, Shadeborn contains one scene in particular that is probably my favorite scene I’ve ever written in any book so far, which is not on the cover of THIS book, but will definitely be on the cover of A book in the future. Shadeborn is where I feel like Underrealm starts to become a real world. I mean, for one thing, we’ve heard a lot about the nine kingdoms, but Loren and her friends have never actually left the kingdom where they started—until Shadeborn. It’s also where we AND Loren start to realize that her actions have consequences that reach far beyond what she herself is able to see. Which was very intentional, considering that I’ve always thought of the Nightblade Epic at least partially as a coming of age story. Maybe my personal decisions didn’t affect the fate of nations, but after you’ve made your own way into the world, you start to realize that the things you do don’t just affect YOU, but have a much greater reach than they did when you were, you know, barely a human. Not to toot my own horn too much, but there’s one more thing about Shadeborn that I really liked. 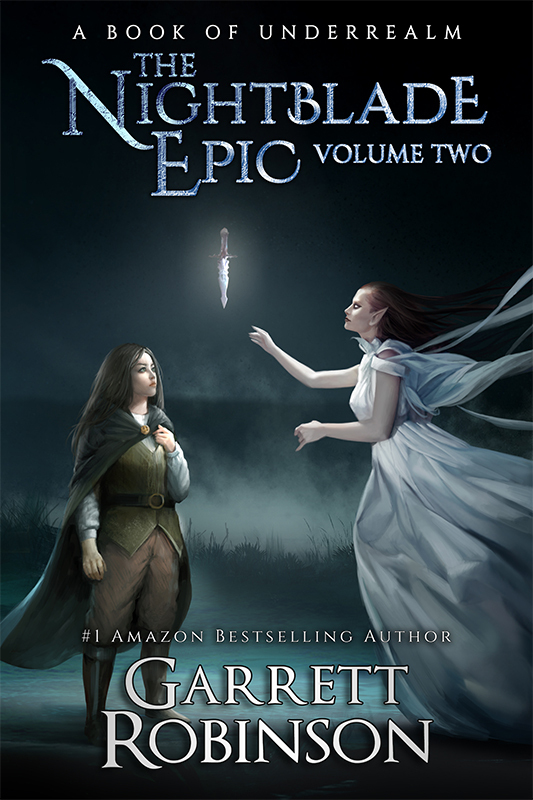 The Nightblade Epic is not technically a Young Adult series, but it also doesn’t really break any of the rules of YA, and a lot of people classify it as YA. Which is fine. But one thing I didn’t want to do was have a young teenage girl protagonist who’s so focused on romance that it becomes a kind of “overpowering” element of the plot. Not that that’s a bad thing every time it happens, but it does feel like a LOT of YA girl protagonists make decisions based on romantic attraction even when they’re dealing with situations that affect the fate of, like, entire nations. So in the first three books in the series, Loren has virtually no romantic attachment whatsoever. That changes in Shadeborn, but I’d like to think I avoided that trope, while still bringing a new dimension to Loren and her character development. So that’s Shadeborn! It’s coming out next Friday, and you can buy your copy using the link in the description below. ALSO, if you leave a comment on this video, you’ll be entered to win a beautiful signed hardcover copy of the book, so drop a comment below telling me you want to win it! That’s all I’ve got for you today, Rebel. Check out yesterday’s VEDA video right up there, or check out my Patreon right down there. Five-dollar patrons get all my books for free when they release, including this one.